Product prices and availability are accurate as of 2019-04-22 19:44:08 UTC and are subject to change. Any price and availability information displayed on http://www.amazon.com/ at the time of purchase will apply to the purchase of this product. 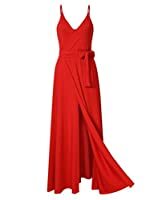 S=US 0-2 / UK 10 / EU 36 : ---Front Bust Recommend :33.9-35.4" --- Waist Recommend :26-27.2" --- Hip Recommend :35.4-37" --- Length-Without Strap :31.9"
M=US 4-6 / UK 12 / EU 38 : ---Front Bust Recommend :35.4-37" --- Waist Recommend :27.6-28.7" --- Hip Recommend :37-38.6" --- Length-Without Strap :32.3"
L=US 8-10 / UK 14 / EU 40 : ---Front Bust Recommend :37-38.6" --- Waist Recommend :29.1-30.3" --- Hip Recommend :38.6-40.2" --- Length-Without Strap :32.7"
XL=US 12 / UK 16 / EU 42 : ---Front Bust Recommend :38.6-40.2" --- Waist Recommend :30.7-31.9" --- Hip Recommend :40.2-41.7" --- Length-Without Strap :33.1"